Dale Steyn hopes to return to Hampshire next summer after a successful stint with the county. South Africa fast bowler Steyn took 20 wickets in five County Championship appearances. The 35-year-old has returned home before the end of the season to prepare for his country's one-day series against Zimbabwe later this month. "I've really enjoyed playing here, but I've still got a lot to offer in international cricket," Steyn said. "There's 500 Test wickets and 100 Test appearances that I would still like to achieve. "But the reality is they're both going to be quite difficult to achieve and will take me some time, possibly another two-and-half years. "Will South Africa still want to pick a 38-year-old by then? I don't know." Steyn is centrally contracted with Cricket South Africa until July, after the 2019 World Cup, and feels another spell in county cricket could follow it. 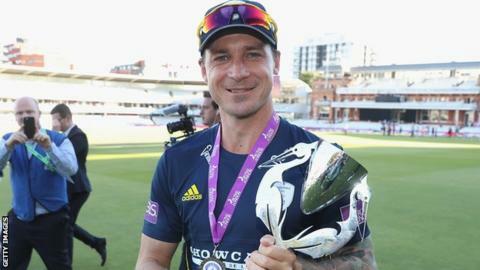 "I think [county cricket] will always be waiting for me," he told BBC Radio Solent. "I love playing cricket all year round, that's what I do. "It's not nothing to do with any other decision than continually playing and if I'm not going to be plying my trade with South Africa, then why not here?" The right-armer took 13 wickets in Hampshire's last two crucial Division One victories, which look to have eased their relegation worries.